There are some very interesting and yes, reassuring, stories in the books spanning Christian Bible. One of these is the story of the journey of Tobias, who was on an errand to a far city to retrieve some money left there as a deposit by his father. Here’s a digest of the story, and my comments follow. There was a time when an elderly patriarch named Tobit needed to get some money he had left in the care of a kinsman in a distant city. Now, Tobit was old, and had gone blind with age from some white films which had covered his eyes. Tobit was very distressed and bitter because he had lost his eyesight. His wife Anna did all she could to comfort him, but some days he was just depressed. On this day, Tobit called his son Tobias into the house and gave him a task. It was time for the money to be retrieved, and Tobit was told to go and fetch it. He did not know the way, but his father gave him instructions to go out and find a guide. Tobit would like the guide to be a companion and trustworthy, and a kinsman. Tobit met a man named Azariah in the town square who was of good character, and he met all of Tobias’ requirements. Azariah did not reveal that he was an incarnation of the Archangel Rapha-El. With instructions in hand, Tobias and with Azariah as a paid companion, off the two went. Tobias’ family dog ran after them, and the two companions decided to let the dog travel with them. Not far into their journey the stopped to refresh themselves in the Tigris river. While rest, a huge fish jumped up out of the water, and Azariah shouted, “GRAB THAT FISH! Hang onto it!” So without a second thought, Tobias grabbed the thrashing fish and wrangled it to the shore of the river. Strangely, Azariah told Tobias to cut open the fish, take out the heart, the gall, and the liver. Tobias did this, and they cleaned the fish, tossed away the intestines, and had a good dinner of roasted fish, and kept some of it to be salted for later because it was a big fish. As they were dining, Tobias wondered what the meaning of keeping these certain organs of the fish was, and he asked about it. Azariah told him about the medicinal value of these odd items. He said, “As far as the heart and liver go, you will need them to burn in the presence of someone (man or woman) who is afflicted with a demon or evil spirit. By making smoke, this combination will cause every evil affliction to flee and they will unable to come back to that person again. Now, the gall can be used to remove the white films on a person’s eyes so they can see again. The story continues with the pair travelling to their destination, meeting a wonderful young woman named Sarah. Tobias was a kinsman, and in the tradition of the day, he was to be her husband when the time came. She had been sent to be married before, but she remained in her unmarried state, because something strange always happened: her groomsman was always dead before any consummation took place. In short, she was just as a virgin, and never took a groom’s name. Tobias married her, but before they entered their marital bed, he and she said words as Azariah instructed, and burned the two fish parts to make smoke. Tobias fought the angry demon when it fled from his new wife’s presence and with the help from the fish parts, he won and the demon fled. The two became husband and wife, and their marriage was sealed and happy. Having completed their mission, the two men made the decision to gather up the money and wedding gifts, and the party left Ragus to return back to Tobias’ home. 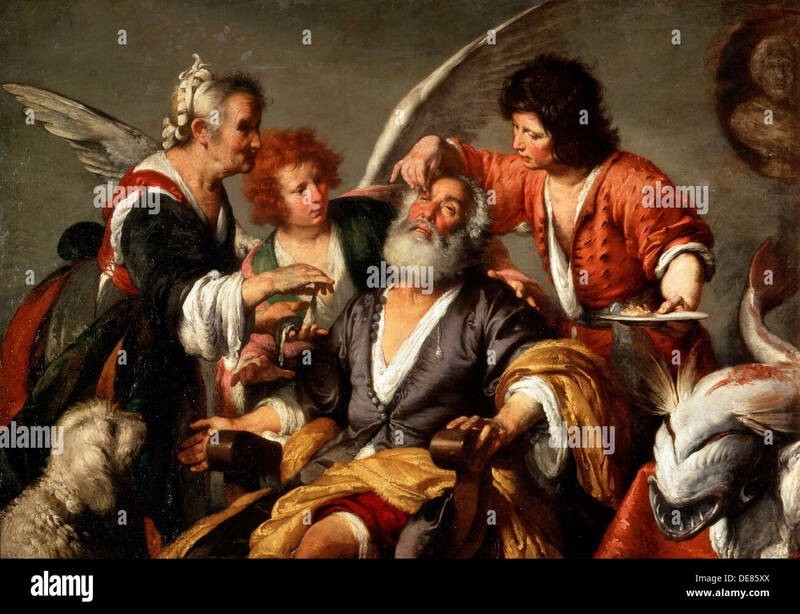 When the retinue arrived back home with Tobias, it included a new Bride named Sarah, all the money and medicine for Tobit’s blindness (Tobit was Tobias’ father). The gall was applied as Azariah told, and Tobit, who had been depressed and despondent at the loss of his eyesight, was able to see and he was joyous. When he could see again, he wept for joy! He blessed the Lord, the holy Angels, he wept at the sight of his son and his daughter in law. After this great journey, Rapha-El finally disclosed his true nature and his Angel Name. He gave them some advice: Now the whole truth can be revealed. He said that it’s good to conceal the secret of a King, but to reveal it with due honor the works that were secret. Medicine of the heart and liver on a demon. It’s well observed in many cultures that the heart is seat of love, kindness, and fortitude. It’s the center of the higher consciousness of love and affection. The nature of the liver is that of keeping the body alive by constantly removing toxins and dangerous substances from the body. It’s also the seat of more primitive emotions and anger. It seems the “medicine” included the use of the characteristics of Anger and its opposite Love in the structure of unconditional positive regard. The nature of those attributes is such that eventually, though rage and negativity are dominant for a while, most of the time, that Love will succeed when the load of anger is settled at last. So, I really like this story from the Book of Tobit in the Christian Bible, and see a lot of wisdom in there. Sure, it’s written in a patriarchal time and for that period. In order to be living as a manuscript though, we can each interpret and receive wisdom where it is. When I work with Angels today, it’s good to know that Rapha-El will actually manifest as a person, might not tell his Angel Name, but will walk with us as individuals, will guide us, and impart esoteric knowledge, spiritual and medical advice, and leave us better than we were. Lizzie B ennett is a Registered Nurse and Ordained Minister of some years. She is a thought and cognitive therapist and owns Three Moons Medicine™ as her private counselling and coaching practice, a blog, educational forum, Facebook page, and outreach to support others on their journey.